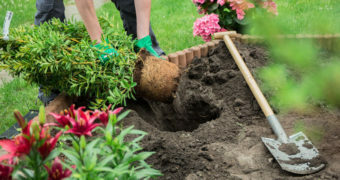 Springtime is about to be upon us once again, and as the winter weather gives way to the warmth and sunshine of the growing season, people start to consider relocating. Of course, spring time is a great time to sell property, as people have been thinking about buying all winter long and are ready to begin house hunting. Still, buyers want good deals, and you’ll need to take the right steps to make sure that your home sells fast and for the right price. Discover five great tips for selling your home this spring for top dollar, and how an experienced Williams Lake real estate agent can help. You hear a lot about curb appeal when it comes to staging a house, but if you’re looking towards selling your home in the spring, curb appeal is huge. Most people can decide within one minute after viewing a house whether it’s right for them or not. Make sure your hedges are trimmed, your garden is weeded and looks great, your grass trimmed and the house painted and clean. It’s a hard truth, but when people enter your home they don’t want to see the hard work you put into it. They want to view it as a blank slate, for its potential and what kind of hard work they can put into making it their own. That means cleaning it out. The emptier your shelves, tables and closets are, the more spacious your home will appear. Get a storage facility and put your goods away. You want your house to be in good shape. This doesn’t just improve first impressions, it avoids complications when it comes time for home inspections. It couldn’t hurt to have your own inspection done so you’ll have an idea of what repairs you’ll need to make. Get everything up to date and up to code. Do some research. Find out what comparable properties in the neighbourhood are selling for, and price your home accordingly. Of course, you want as much as possible for your house, but setting the price too high will act as a turnoff and you’ll lose out on offers. Too low and you won’t get as much as you deserve, or people might wonder what’s wrong with it. Working with the right Williams Lake real estate agent is key to selling your home fast and for top dollar. A local expert realtor knows the neighbourhood, the value of local properties, and has experience with staging homes for sale. They can be your best advisor and help in getting your home off the market and money in your pocket. If you’re looking for help selling your home in the spring, turn to the expert local Williams Lake realtors at Team Moore. We’ve got the experience, knowledge, dedication and drive to get you the most for your home. For more information or to get started, give us a call today!